Bloody cyclist jerks! Slowing down the traffic! I do feel sympathetic towards motorists, battling the traffic just to make it to work on time and then to turn around and fight the traffic all the way home when all you want to do is sit down with your significant other for a chat and a quiet meal. After all, I am often one of them. But spare a thought for that jerk your about to beep your horn at, fighting the same traffic, without the protection of your cars’ metallic exterior. We’ve all seen some cyclists who are undeniably jerks. But are jerks more highly represented amongst cyclists than amongst motorists? Or any other arbitrary group for that matter? Why don’t these jerks get off the road?! I must say, the foot path is my preferred option these days. Though not as smooth as the road and often packed with pedestrian traffic, it does have the advantage of a lower density of opening car doors. I’ve had one too many bonding sessions with car doors. So far, I’ve been very lucky and I’m not too keen on pushing that luck much further. However, the footpath often does not offer any more shelter from abusive tirades than the road does. Unfortunately, my well oiled machine does not make a lot of noise and I tend to scare the odd pedestrian. I have tried ringing the bell to alert pedestrians to my approach, only to be told to “get off the footpath!” or “slow down!” (even though I’m already riding the brakes). I have even been pushed from my bike by a spiteful pedestrian. Though I must say the vast majority of pedestrians are happy to share the footpath. I also sympathize with pedestrians. I know it’s not pleasant to get a fright when that jerk cyclist sneaks up behind and wizzes past. But is it deserving of a verbal beating? Does that save any face? What does it accomplish? Apart from making someone else feel crap. I assure you, that cyclist didn’t set out to frighten the bejesus out of you (unless they really are a jerk). 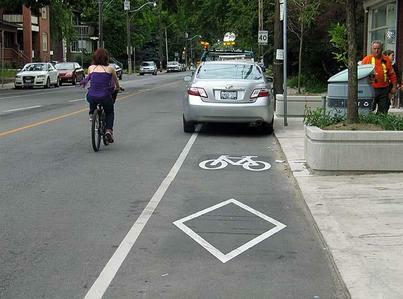 Some councils are thoughtful enough to provide bike lanes on major transit routes. Unfortunately, since these lanes are often an add-on, they tend to just get squeezed in beside the other vehicular lanes. All too often they are blocked by parked cars or buses or moving vans or emergency vehicles etc. 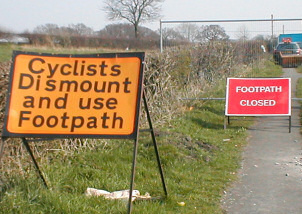 and once again, the cyclists are forced onto the road or the footpath. Obviously, some cities are much better than others in their provision of bike friendly routes (Canberra was great!). Many of us are just trying to save a buck. Some of us might be embracing our inner hippie and trying to reduce our impact on the planet. Others might simply be trying to drop those kilo’s after the latest Christmas period. Others still, might have simply lost their licences or not even have a car in the first place. Some might just love the feel of the wind on their faces. Any or all of the above could apply to that jerk slowing you down. The point I’m trying to make is to give that jerk cyclist a break. When it comes down to it, they’re probably going to catch up to you at the next set of traffic lights, so how much are they really slowing you down? In the end, we’re all (cyclists and motorists) just trying to make it home in one piece.